Ryan is the managing partner and clinical director of the Norwell location. 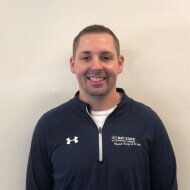 He received his Doctorate degree of Physical Therapy from the University of New England and also holds a Bachelors degree in Exercise Science. After graduation, he completed a one year residency program followed by a one year fellowship program in advanced manual therapy techniques at The Institute of Orthopedic Manual Therapy. Here he gained the distinction of Orthopedic Manual Therapist. When designing individualized treatment programs, Ryan utilizes a variety of manual hands on techniques and therapeutic exercises, as well as provides detailed patient education. Ryan has extensive experience treating a variety of orthopedic, post surgical, and athletic injuries. He also has significant experience treating injuries sustained from motor vehicle and work related accidents. He is committed to giving exceptional one on one care and is focused on providing evidenced based interventions to help each client reach their individualized goals.